A little while ago, I was contacted by Joe McCullough at Osprey Publishing with an invitation to contribute to Osprey’s first fiction anthology. Joe has edited all five of the books I’ve written for Osprey so far*, and I guess he must have liked my work. As well as being one of the most pleasant editors I’ve ever worked with, he’s designed a very nice little fantasy skirmish game called Frostgrave, where wizards of various schools assemble bands of minions to explore and loot an ancient city as it emerges from an icy prison. I got a sneak preview, and it looks like a lot of fun. 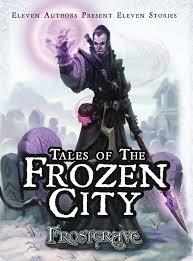 Tales of the Frozen City was put together to help support the game, and I’m in some distinguished company in this 11-story collection. There’s Fighting Fantasy historian Jonathan Green, fellow Games Workshop alum Matt Ward, and, as they say, many others. I’m proud to be counted among them. I just received my author’s copy of the collection, and it looks beautiful. Both electronic and dead-tree versions are available from Osprey and from your favorite retailers and e-tailers. I hope you’ll check it out. Check out the game, too: it looks like a lot of fun.